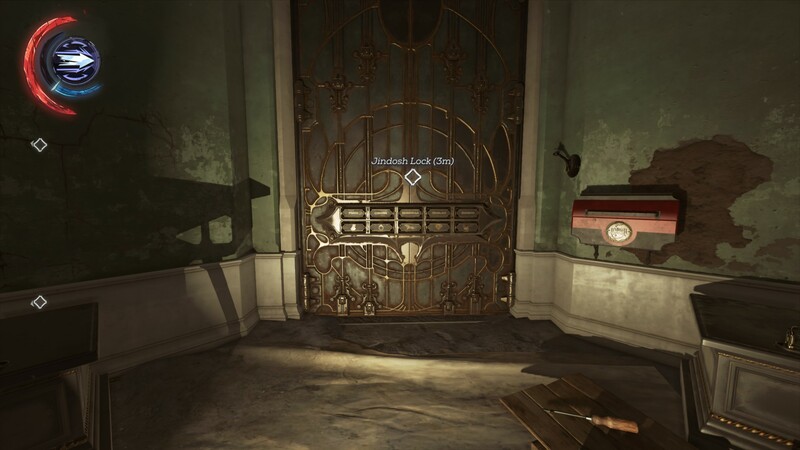 Guide on how to complete the Jindosh Riddle in Dishonored 2. 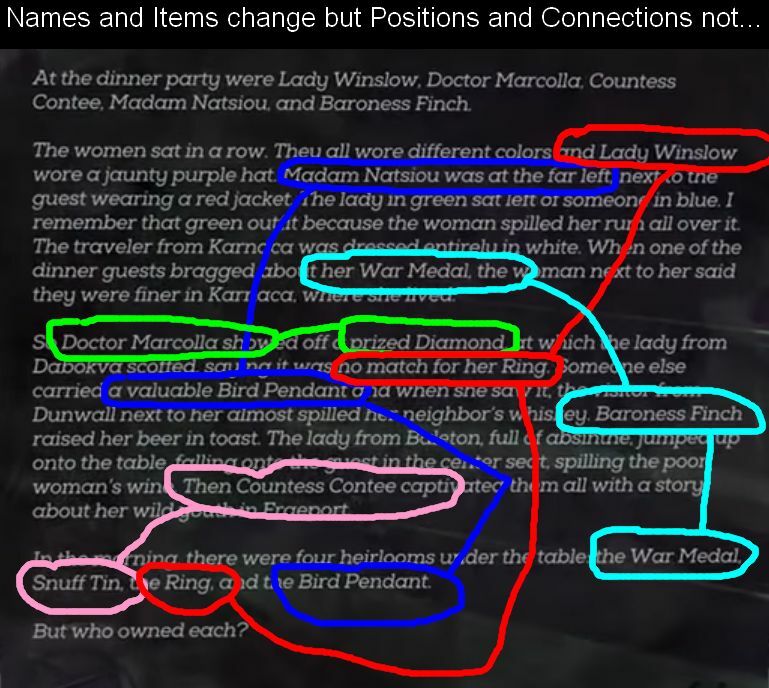 The Jindosh Riddle is a logic puzzle found in the Dust District of Dishonored 2. While it is unnecessary to complete this puzzle to advance in the game, it does offer an achievement and significantly shortens the level. The puzzle tasks you with placing 5 individuals in order with an heirloom that each possess. The information to complete this logic puzzle is given in the form of a story problem that contains 6 different elements (Person, seating position, drink, outfit color, heirloom, country of origin). The story is different for each player, as the nouns are re-arranged randomly each game. Make a logic table and painstakingly work through the data to derive the conclusion. Figure out the solution pattern. Because we’re not in grade school anymore, let’s just jump to option two. 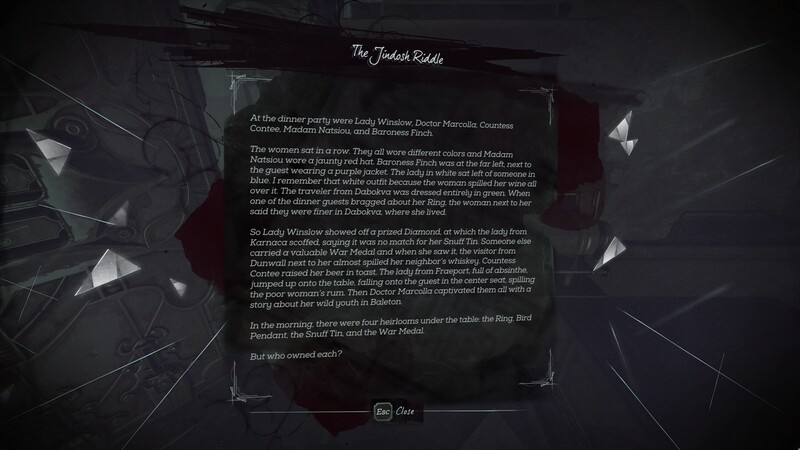 Step 1: Read through the story and write down the names of the 5 individuals in the order they appear in the story. Step 2: Read through the story again and write down the 5 heirlooms in the order that they appear. This is the easiest way to get the Eureka achievement. In the Dust District, make a save when you get to the lock. Get the riddle solution by killing the two leaders or bringing one to the other. Go back to the lock and write down the solution. Load the Savegame you made earlier and use the solution. The Names and Items are randomized but positions in Text are static... The Map has been tested with several Variants and works 100%.